A friend of mine flat-out stumped me with this question a few days ago, and I’m willing to bet even odds it stumped you too. Neat, right? People familiar with anime likely have at least some vague inkling about what light novels are. But anime-focused writers who offer sweeping takes on light novels often don’t have the answers to those sorts of basic trivia questions, and I’ve forced a few acquaintances to google over this in the past week. Granted, this particular question is sort of misleading; wordcounts are more accurate quantifiers of length than pagecounts, since the latter depend on size and typeface. Still, it underscores how little people can know about something which plays such a big role in the anime industry. Too, the question is also ridiculously basic to answer; I only had to spend about an hour on amazon compiling a list of links to the first volumes of novels adapted into anime in 2013 (excluding sequels), and taking down their given pagecounts. And while I was at it, I did the same for manga. The data, source links included, can be found here, and is summarized below. Note that Uchouten Kazoku, a single-volume novel, was counted as a novel along with the other multi-volume series. 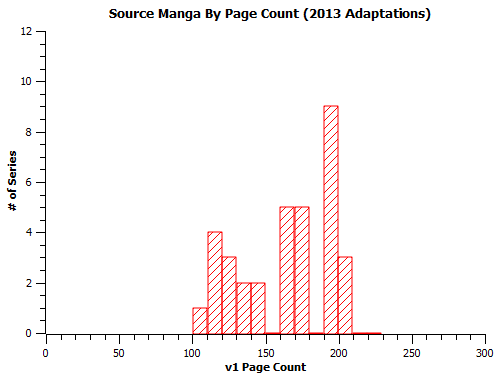 The average volume 1 of a novel adapted into anime in 2013 was 302±45 pages. Most volume 1s fell within this range. There were a few exceptions; Maoyuu Maou Yuusha (361pg) and Uchouten Kazoku (423pg) were significantly longer than the norm, while Kami-sama no Inai Nichiyoubi (253pg), GJ-bu (232pg), and Brothers Conflict (195pg) were significantly shorter. The longest and shortest first volumes of manga adapted in 2013 were Aku no Hana (208pg) and C3-bu (109pg). In general, it seems like the shorter-volume manga were more likely to be 4-koma (Love Lab, Puchimas) or short-chapter (Non Non Biyori, Kitakubu Katsudou Kiroku) series. The middle group, with pagecounts between 160 and 180, seem to contain mostly niche material (albeit some decently long-running ones), while the longer group, with pagecounts 190 and above, seem to contain the more mainstream series. At this point, I don’t really know if this information amounts to more than the answer to a trivia question. But there’s never any harm in gathering more data and examining something from a new perspective. This entry was posted in Articles, Fun With Numbers and tagged Anime, Fun With Numbers, Light Novels, Manga by torisunanohokori. Bookmark the permalink. Taking the 113 Japanese light novel volumes that I’ve added to my LibraryThing account as the dataset (111 of these page counts are taken from Amazon, the other two were entered by me), the average (both in terms of median and mean) length is 297 pages. The shortest is 224 pages (Hyouka) and the longest 376 (Oda Nobuna no Yabou vol. 5). There are two distinct clusters around 260 and 315 pages (23 of the volumes are in the 251-260 page range, and another 23 in the 311-320 page range, making more than 40% of the total between them). Obviously this isn’t a random sample, as some series tend to have longer volumes than others (all 7 volumes of Sakurasou no Pet na Kanojo I own are 327 pages or more, whereas all 7 volumes of Seirei Tsukai no Blade Dance are 262 pages or fewer) and as such the data is likely to be skewed towards those areas which may have large numbers of volumes from the same series. It’s interesting to note that light novels translated into English tend to be significantly shorter than the Japanese versions. Accel World vol 1 is 296 pages plus commentaries in Japanese, but just 205 plus commentaries in English. Incidentally, the LibraryThing data (which in both cases here is lifted straight from Amazon) includes the commentaries in the English page count but not the Japanese one. Which exposes the other flaw in this process – the variability in what is or is not included within the page count by Amazon. Neat that the bimodal distribution pops out of a larger sample. Neither of ours are truly random, given that LNs adapted into anime are also a special subsample. The best way to go would probably be just to analyze all the v1s released in a given 1 or 2-month period, probably. Translated light novels being shorter is kind of the opposite of what I would have expected. I remember Mother 2/Earthbound had a scene that took 2 minutes longer in the localization simply because the English scrolling text took up that much more space. Do they change the formatting significantly between versions? I guess it would make sense, given how niche they are overseas, to try and save on paper as much as possible. The most annoying thing about amazon is that it didn’t even offer page counts for some of the manga volume 1s – had to go to the second volume to get data for Yama no Susume, Crime Edge, and WataMote. – The pages in the English versions are larger. The Japanese Accel World has 17 lines per page (albeit going downwards) whereas the English has 35. Thus a short line (containing, for example, a couple of words of speech – which is pretty common) takes up rather more of a page in Japanese than it does in English. – Japanese text, while using fewer characters, uses more space per character with the same font size. This is because writing in English (and similar languages) compresses the characters together to match the size of the character being used. Imagine if a comma or full stop took up the same amount of page space as the largest of letters (a W perhaps?). That’s the situation in Japanese. – Light novels in Japanese tend to start new lines/paragraphs a lot. Most fan translators seem to keep them this way but in English it rather breaks up the flow of the text, or gives the feeling of emphasising something that really doesn’t need to be. The official translations thus will group several of these together as standard practice, making them more natural English and also (as a side-effect) take up less space on the page. Those binomial distribution are an artifact of the printing process. Most light novels are bunkobon printed in A6-sized paper. The full-sized A0 paper printers used can be cut into 64 A6 pages, so it’s most efficient to print 256 (4 x 64) or 320 (5 x 64) pages.